After nearly three months of preparation, more than 30 students helped put on the two back to back sold out shows of this year’s Friday Night Live. Keeping the noise going for the evening was the FNL band, made up of students. Hosted by Trevecca’s very own Dr. Mike Jackson, FNL drew nearly 500 people. Both shows originally had 150 seats sold, but 50 were added to accommodate for the high demand in attendance. After all seats were filled, people sat on the floor along the wall to have a chance to see the show. 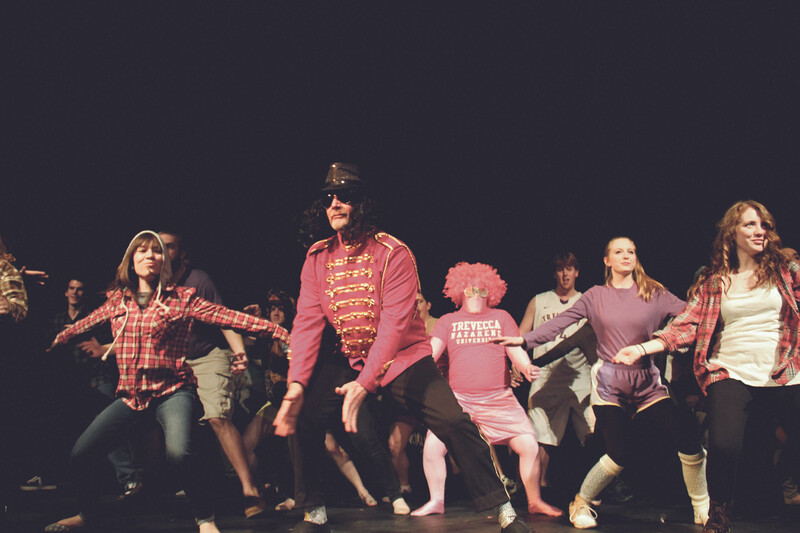 Friday Night Live is Trevecca’s version of the famous Saturday Night Live, put on entirely by Trevecca students and faculty. This year’s show featured the Trevecca Hunger Games, Freaky Fiesta Friday, Dan and Denise Boone showing off their dancing skills, and more. The crowd favorite for the night was “The Newlyweds Game,” in which Bible characters fought to win the prize, ending with a spoof of Disney’s “The Lion King,” but with the birth of baby Jesus. Another act the crowd loved was a spoof off of a Lonely Island song called “I Just Did Checks,” which was about a night resident assistant doing checks during open apartments and handing out fines to students. Kaylon King, sophomore music business major, took on the main leadership role for this year’s show, but many others helped pull the show together as well. Dr. Michael Jackson, associate professor of religion, was decked out in sequins and wore a white glove showing off the moonwalk and dancing the Thriller dance as the host for the evening. “It was a lot of fun. I think we all [cast and crew] got two and a half hours of sleep last night but it all came together tonight. We tried to make people laugh and have fun and it really went well,” Jackson said. Andrew Morris, a Trevecca student and show attendee, loved the show. “A lot of my friends were in it, so it was good to see them do their thing tonight onstage,” Morris said. At the end of the night, all sequins were cleaned and all chairs straightened, as another year of Friday Night Live at Trevecca came to a conclusion. Michael Jackson is the king. Anytime i listen to his records i feel like he is still alive. For sure one of the best music stars ever!